Directions: Sift together 1 cup sugar, 1/3 cup flour, and salt. Add eggs and sour cream. Stir until blended. Drop blueberries into prepared pastry shell and spoon sour cream mixture over berries. In another bowl, combine 1/2 cup sugar and 1/2 cup flour. Cut in butter with pastry blender until mixture resembles course meal. Sprinkle this mixture over creamed mixture and berries in pie shell. Bake at 350 degrees for 50 to 55 minutes, or until lightly browned (I usually have to bake for a good 20 min. longer). We like to eat this either warm or refrigerated until completely cool, either way it is delightful! Hello, I saw your link-up at Ginger Snap Crafts and had to come by to check out your recipe. This is definitely a must-try. Pinning to my Creative Yummery board for pies! Oh... This looks wonderful! I pinned it too. I will be making this. 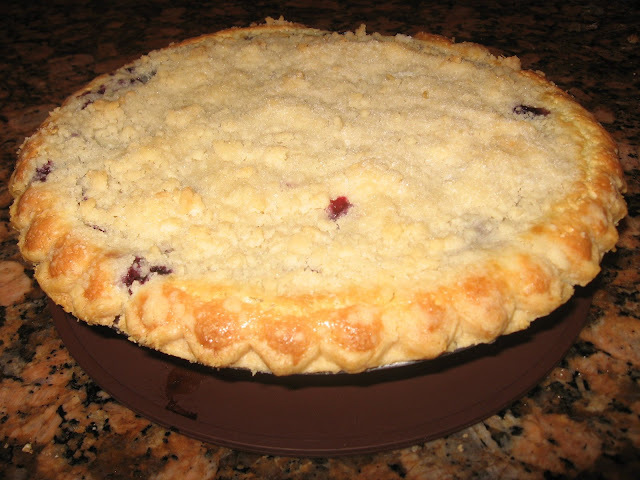 Blueberry pie - esp with a really good crumbly crust is my all-time favorite and I am soooooooooo making this tonight with m y 10- year old niece who is spending the night tonight. YAY - thank you so much for sharing - and thanks for y our visit and super sweet comment! YUMMY!! Does that ever look delicious! Oh yum! I just happen to have some blueberries in my fridge. A gift from my cousins daughter. She brings me a container each year. I will be trying this! Thanks for sharing the recipe with SYC. I will be featuring you this week. I think I had a senior moment. I have Blackberries, not blueberries. Wonder if they would work? I'm sure it's not intentional, but I didn't see Share Your Cup listed among your link parties. I am featuring this pie tomorrow at Home Sweet Home! It looks amazing! I came over from Share Your Cup - This looks delish. Saw this featured on Home Sweet Home ~ it looks delicious! Ohhhh it looks so delicious....and pretty too!